It gives us great pleasure creating projects that make our clients happy they chose us. Receiving great feedback is truly what makes us get up in a morning, and hopefully these few selected comments speak volumes! We used Norman and his team to block pave an awkwardly shaped area in our rear garden to the side of our house.The work was started on time and fully completed in only two days. Norman was very helpful and advised us regarding which colours and materials to use.His team were very tidy and finished the job to a high standard using several small cuts to make the finish perfect. Overall this has transformed what was previously an unused part of our garden .We were very pleased with the work and the bill which was very competative.We would certainly use him again in the future. To Whom it may concern, I am very pleased to write this letter of recommendation for N and P Paving (proprietor Mr Norman Harbron). My family and I have used N and P for several jobs and have always found them to complete work to a very high standard. From start to finish, N and P provide outstanding service at a competitive price. Excellent communication really sets them apart from most trades people – Norman will arrive or call when he says he will, or give a courtesy telephone call in the unlikely event that he is running late. Work starts promptly and deadlines are adhered to throughout the project. The quality of workmanship is very high and the men carrying out the work are all very polite and helpful. All in all, N and P are a pleasure to deal with, providing a professional, reliable and efficient service at a very fair price. I am writing this because I have been so impressed by N and P and would like other people to benefit from their brilliant service. Please feel free to contact me via Norman to discuss any aspects of this letter. N&P Paving have been asked to work at Lingey House Primary School many times over the last five years. The standard of workman ship is excellent and the attention to detail second to none. The bespoke work undertaken here has always been priced very competitively, Norman has always offered advice and given a service of design to finish. Work has always begun promptly and finished within the allocated time and to a high standard. I have lots of photographs of N&P work and would gladly email any on request. I used N P Paving in August 2011 to lay my new drive at my home and was very impressed by the professionalism and quality of work. They started the work on the date we agreed and when i wanted extra works done Norman could not have been more helpful and carried out my wishes immediately. The completed works were exactly as i had wanted. 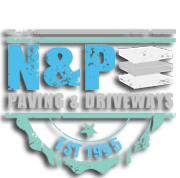 I was so impressed that i have since started using N P Paving for all my paving, driveway and fencing works for my own business. N P Paving come highly recommended by Langley Property Maintenance Limited. We employed N & P Paving to replace and extend our driveway with block paving and to rebuild the front garden wall. Design and plans were discussed and dealt with very efficiently. The work involved was carried out to a high standard with quality materials and completed well within the planned timescale. Although the renewal of the driveway and wall was done in January 2005 there is no sign of wear or deterioration whatsoever this in itself is proof that a job well done will last for years. This year (2012) we employed N & P Paving to replace two lengthy wooden garden fences. The fence builder and his assistant were punctual, cheerful and finished the job in the time agreed. Again, high quality timber was used and both fences are strong, smart and skilfully made an enhancement to any garden. We can with confidence highly recommend N & P Paving to carry out any work to the highest possible standard. Norman, Many thanks to you and all your staff for the excellent work you carried out for Christine and I. Please feel free to use the following in your testimonials. Having used N&P Paving to clear out and pave the front garden of our new house in June 2013, my wife and I were so impressed with the price, quality and speed of workmanship that we asked Norman to quote for clearing our strangely shaped rear garden of large shrubs and bushes and not only laying a large paved patio area but also providing all round lap fencing and a gravelled are for garden ornaments and planters. Quote was very acceptable given the amount of work & materials required. The entire work was completed in only three days. Having been a highly critical Materials Engineer for over 40 years, testing the quality of civil engineering materials and workmanship for Tyne & Wear, I can assure anyone reading this that I couldn’t fault anything that Norman and his staff did. Not only that, but they were all found to have a happy and friendly demeanour and were foremost in fulfilling customer needs. We would have no hesitation in getting Norman and his staff back to work for us again and to recommend them to anyone wanting quality workmanship with quality materials at a fair price.